2009 Is Painted Lady Year! 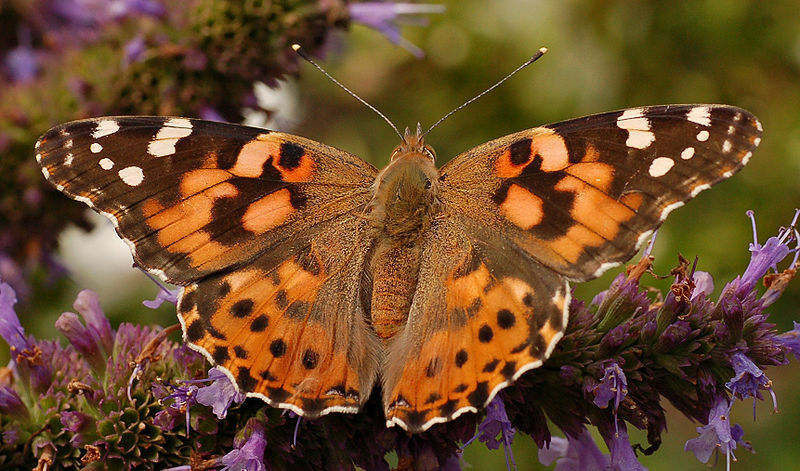 The Painted Lady butterfly is a migrant that normally arrives in Britain from North Africa in small numbers most years. Sometimes, the weather and breeding conditions are just right to create a situation in which millions of these butterflies reach our shores. This happened in 1996, when several million Painted Ladies were recorded in this Country. From reports this year, it looks as if even those numbers could be exceeded! I first saw 2 Painted Ladies in our front garden on 24th May. Barbara and I went to the New Forest for a holiday three days later and, when we went into the front garden of our hotel, on the edge of Lyndhurst, we saw an amazing sight. Dozens and dozens of Painted Ladies were flying from south to north, all following each other along the edge of the trees that formed the garden boundary. After mating, the females normally lay their eggs on thistles, but some have been seen laying them on stinging nettles this year. With the numbers seen, 2009 is already classed as a “Painted Lady Year”, but we may be in for an even greater surprise. If the next generation emerge from their chrysalides towards the end of July and during August, there may be even more “home grown” Ladies for us to see. Kevin Whibley of Captured Moment in Fleet has kindly agreed to provide hints and tips for would-be photography competition winners. In addition, with over 20 years photography experience, Kevin will be delighted to answer any photography question you may have. You can pose questions on this blog by submitting a comment (see below this post). Today’s question: What is a megapixel? Each image is made up of a number of dots of different colours. Each dot is called a pixel. From here you get the number of megapixels (mpg) that your camera has. For example a 5 mgp camera produces an image made up of 5 million pixels creating an image approximately 1826 pixels high by 2739 pixels wide (1826 x 2739 = 5,001,414). A 12 mgp camera produces 12 million pixels as follows: 2828 pixels high by 4242 pixels wide (2828 x 4242 = 11,996,376). So what does the above mean in real terms with regard to the quality of your images? The optimum print quality level is 300 dpi, which means 300 dots for every inch of print. Whilst good print quality can be achieved at lower levels I would not advise going below 150 dpi. So from this we can see that our 12mgp cameras optimum image size is 9.5 inches by 14 inches: 9.5” x 300 dpi = 2850 pixels and 14” x 300 dpi = 4200 pixels. 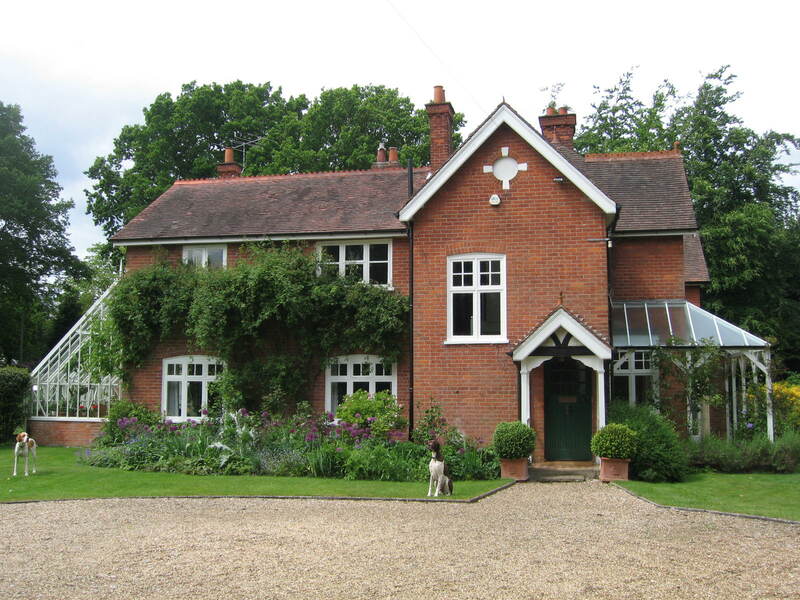 An acceptable image can normally be produced up to 20” x 30” from a well taken shot. Further hints and tips will include hints on lighting, composition etc. Kevin will also reveal why a 12mgp camera may not necessarily produce better pictures than a 5mgp one! Picture credit: see FPS Photo Competition link above. 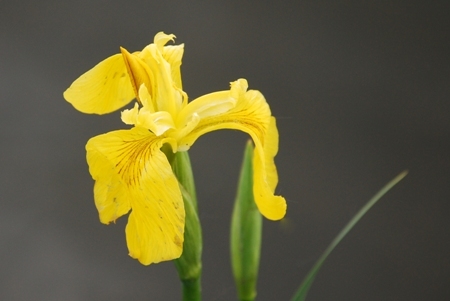 The tall, bright flowers of Yellow Flag iris can be seen throughout the reedbeds and marsh areas surrounding the pond, particularly alongside the path between the station and Boathouse Corner. The large vivid yellow, purple-veined flowers are thought to be the true source of the heraldic Fleur-de-lis emblem rather than the lily. The stylised three-petal emblem has been used for centuries throughout Europe, adorning coats of arms, flags and postage stamps. Woodland around the pond is buzzing with bees enjoying the plentiful supply of honeysuckle. Flowers can last from June through to September, providing nectar for a variety of butterflies and moths. 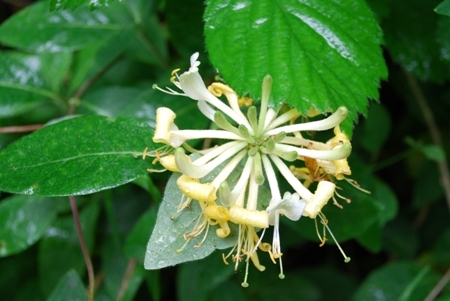 Honeysuckle is great for wildlife as warblers and thrushes eat the berries, and both birds and dormice use the peeling bark from its stems to build nests. Yellow water-lily currently decorates the Flash, the small pool of water by the steps to the station car park. Found in standing or slow-flowing water, the flowers of yellow water-lily produce a strong scent of stale alcohol which attracts pollinating flies. 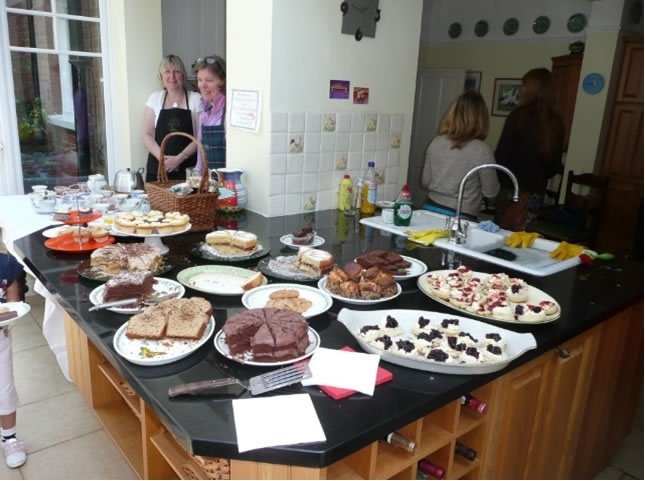 A grand total of just over £2,150 was raised at the Fleet Pond Society Garden Party held at Grasmere, Chestnut Grove on Saturday 13th June. This amount broke all previous records for a volunteer-run event for the Society and is a tribute to all the volunteers who put their time into preparing and running this event. 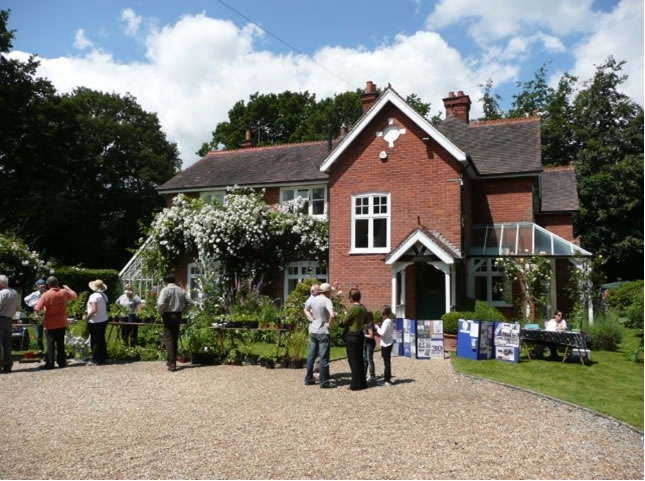 The weather was extremely kind to us and a steady flow of visitors enjoyed the games, and bought cakes, bric-a-brac, books and plants. 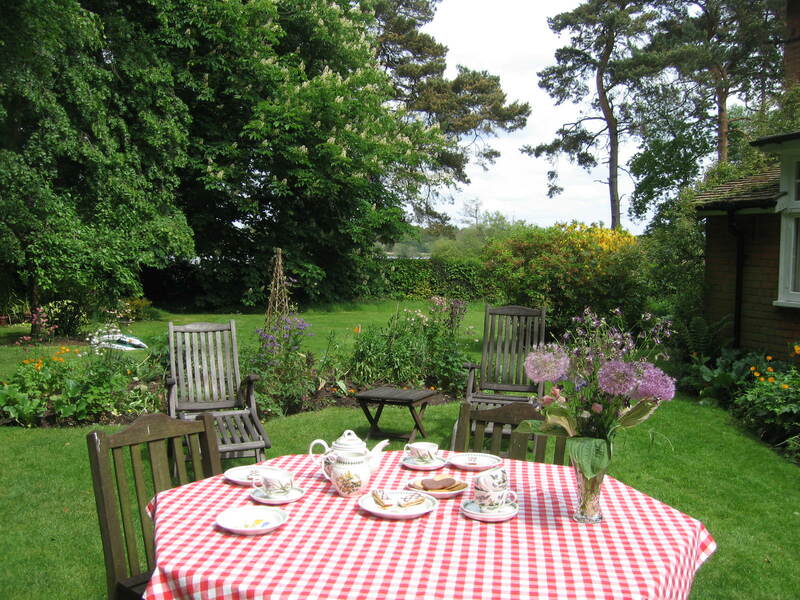 They then rested their tired feet, eating home-made cakes and cream teas, seated in the wonderful surroundings of Nicolette and Richard Pike’s beautiful garden. PC Paul Franks and PC Dan Lehec popped in for a chat and showed the children their handcuffs and other equipment – no arrests were made! 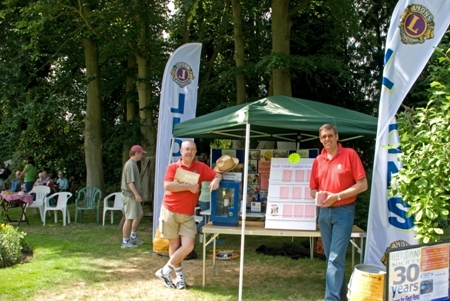 The Fleet Pond Society Committee would like to thank everyone who helped make this such a successful fund-raising event, including the Fleet Lions and the Horticultural Society for the loan of the tables and games, respectively. Most particular thanks must go Nicolette and Richard for opening their beautiful house and garden up for us to share in a little piece of historical Fleet. 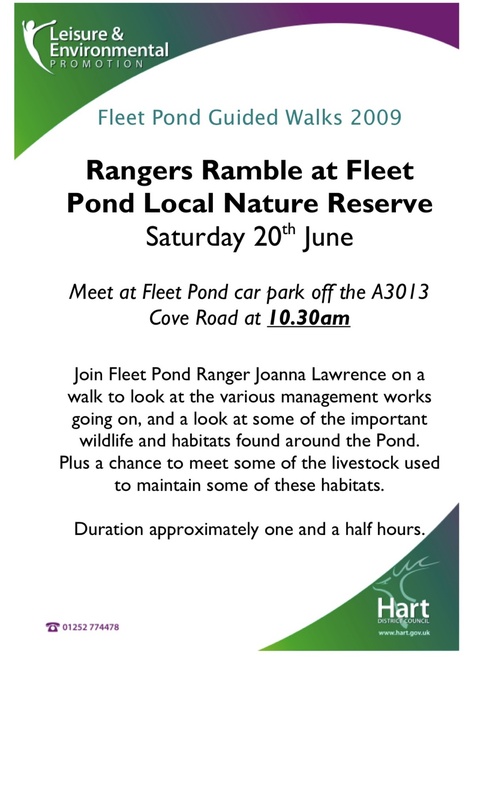 Volunteer Event 10 May – Mending Fences! 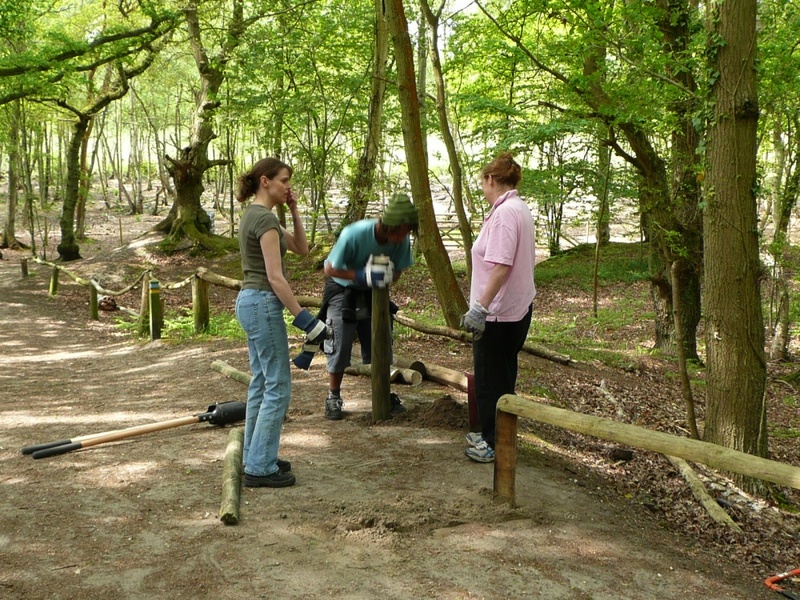 The volunteer event for May focused on mending the protective fencing along the banks above the pony paddock main access (where the water tank is located). The existing fence had become just a line of posts with odd bits of wire remaining to be removed! 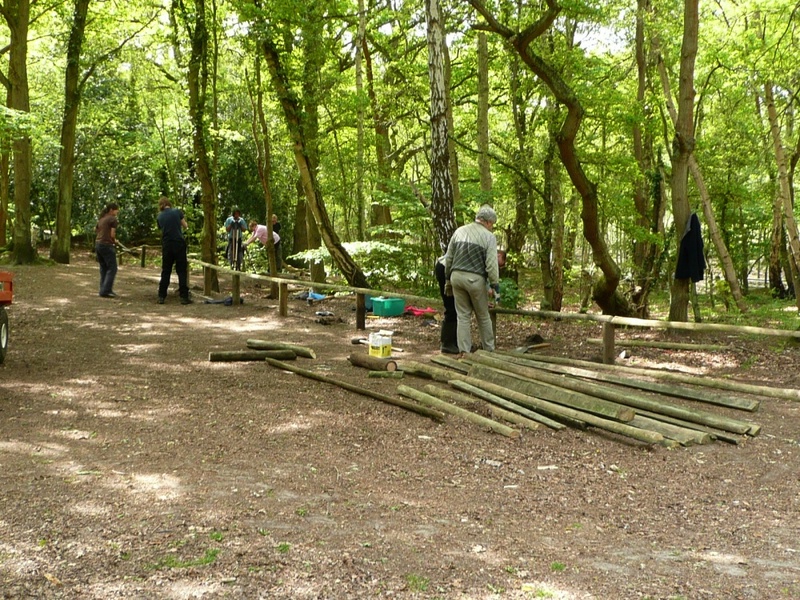 The Ranger, Joanna Lawrence, had made available posts from the workshop storage yard which will be longer lasting than the logs that are usually used and this made an enormous difference. The Ranger, Joanna Lawrence, had made available posts from the workshop storage yard which will be longer lasting than the logs are usually used. Basically the task required lots of digging, sawing and hammering! 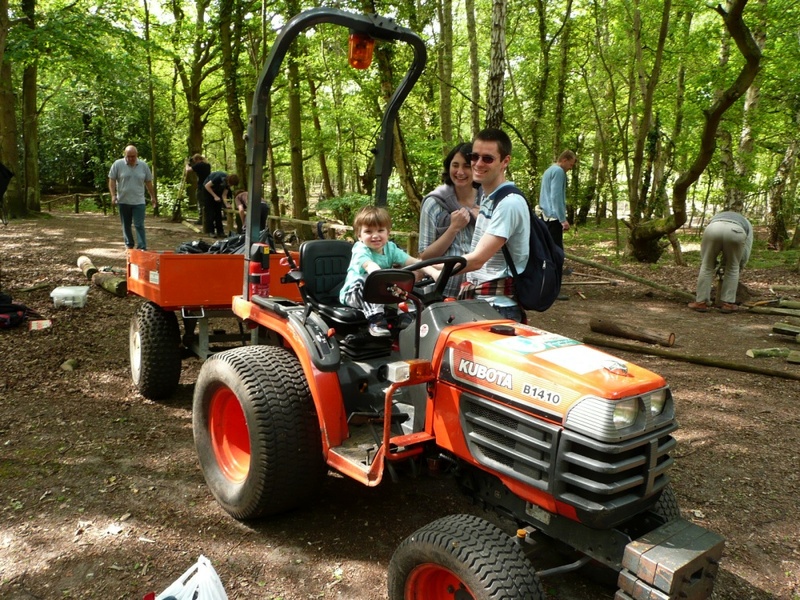 There was a very good turnout on what was an absolutely glorious day and everyone enthusiastically got down to the tasks of digging, sawing and hammering! A variety of passers-by asked about what we were doing and some even wanted to get involved (see picture at top). Picture: Really Getting Stuck In! As an aside, just as the task was about to start we were informed by a member of the public that there was a fire burning nearby that needed to be extinguished. In fact the fire brigade had arrived by the time we got there (in other words, very quickly) and were already dousing the remaining embers. 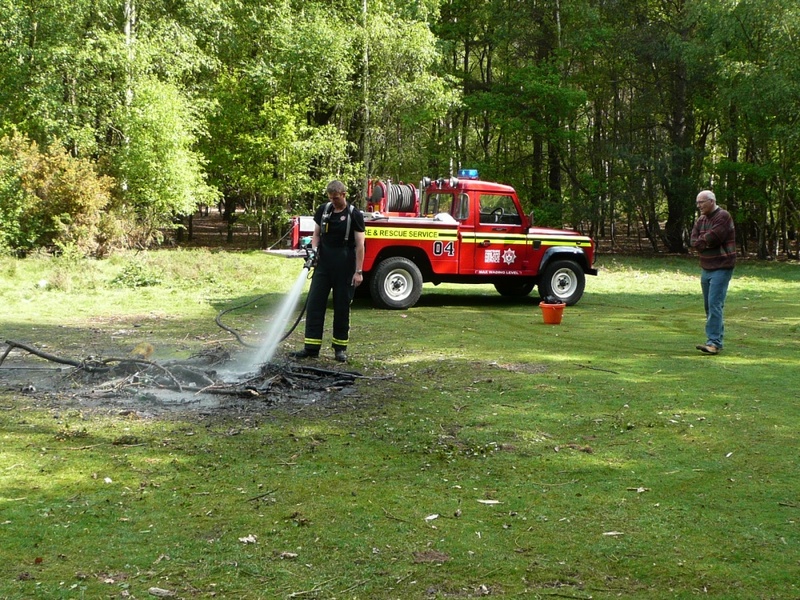 The fire engine was able to get right up to the fire due to it’s compact size. Note: To avoid any possible misunderstandings, in the above photo (‘Really Getting Stuck In’), full H&S precautions were of course taken. Indeed appropriate information on the correct use of tools is given prior to each volunteer event. 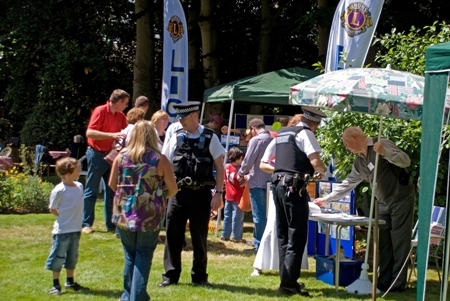 Why Not Come To The Garden Party This Saturday? 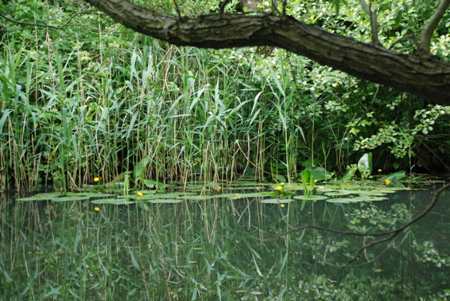 The pictures above and below are of this very beautiful setting which overlooks the pond. 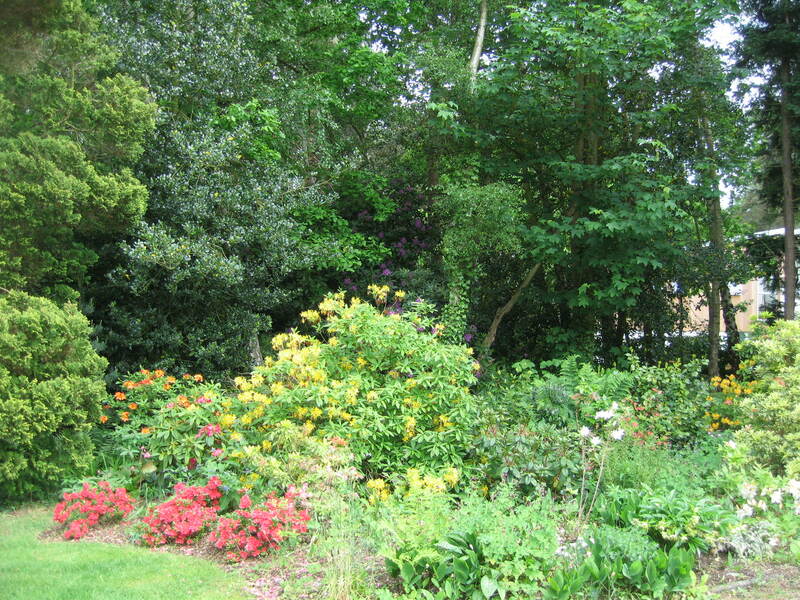 All the proceeds of the Garden Party will go to the upkeep of Fleet Pond Nature Reserve. See also previous post ‘Garden Party In June’. 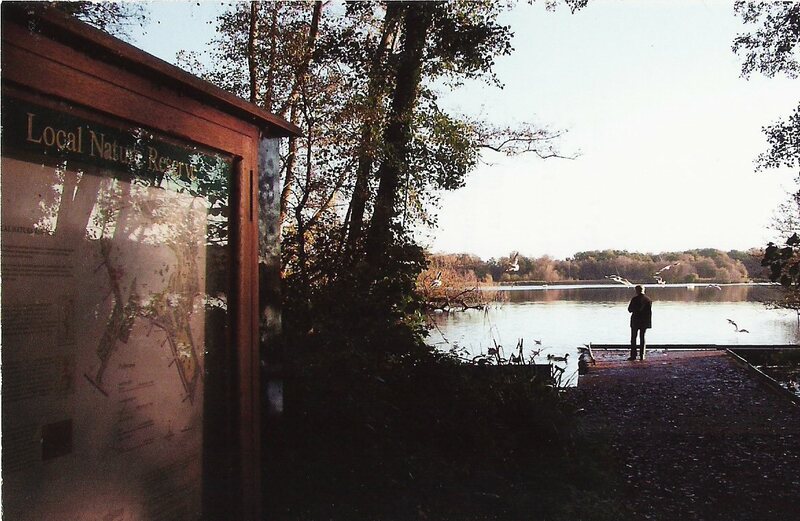 You are currently browsing the Fleet Pond Blog blog archives for June, 2009.